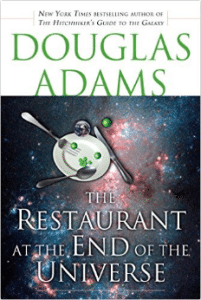 In another schizophrenic ride through highly improbable time and space adventure, Arthur Dent and rag-tag crew are pondering less the true meaning of earth’s creation and more: where would be a really great place to eat. Zigging through space haplessly hungry, with an unknown Vogon bent on destruction siting missiles as we speak, Arthur Dent ties up the Heart of Gold’s circuit drive on one very important, crucial question: the proper way to make a really good cup of tea. About to be destroyed for good, two-headed, three armed Zaphod Beeblebrox, ex-president of the galaxy, bumbling thief, and encumbered with a brain full of secrets, decides that now would be a really great time for a séance. Scaring up an old relative for some help works . . . and doesn’t, leaving the crew separated and destined to have many adventures before finally, they get to eat, watch the universe get destroyed, and then start the fun all over again. 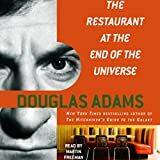 With the charisma of a Monty Python skit and the narrative foundational structure of a dream, The Restaurant at the End of the Universe doesn’t capture the glory of the famous and much beloved Hitchhiker’s Guide to the Galaxy – but it certainly doesn’t disappoint readers with an alien addiction and a desire for the absurd, the highly improbably, and a good lunch. Oh, and if you don’t know what I am talking about, go back to book one in the “trilogy” and read The Hitchhikers Guide to the Galaxy first. Otherwise, even a Bablefish couldn’t help you understand the events in this subsequent novel or really any of my fantastically well-articulated reviews. Functioning as three pseudo connected stories with a break for some good eats and entertainment in the middle, the closed off portion in Zaphod’s brain, previously touched upon loosely in Hitchhiker is causing quite a stir, especially in the world of long dead but still very irascible relatives. Zaphod is destined to discover the true ruler of the universe, the one who does wield the power. This is a scheme long in the making that Zaphod was unaware of yet completely integral to (and in overall agreement with). Don’t ask. I still don’t understand it. Abandoned with Marvin the manic depressive robot on a strange plant, Zaphod must confront his past and sort out the meaning of his mission. Meanwhile, Arthur, Ford Prefect, and Trillion are stuck in space, and not so happy about it. Arthur still doesn’t have his tea either. So, basically, it’s going to be one of those days. Through some strange happenstance that (I guess) is interrelated, all come through the first adventures and finally get to meet at Milliways, the restaurant at the end of the universe which is suspended via advanced time travel/fluctuation technology so every night all the who’s who in the galaxy can have dinner while watching the end of time and the universe in glorious technicolor. My personal favorite moment in the tale, Milliways ramps up the absurdity while temporarily dropping Zaphod’s mission and just having some fun making fun of restaurants, shows, the wealthy, entertainers, and talking entrees which beg you to eat them and pick out succulent portions of their flesh (afterwards they humanely pop into the kitchen to off themselves in anticipation of being well cooked and succulent.) It’s a long, rambling, completely insane, out-and-out brilliant portion of the book. My boyfriend doesn’t know it yet, but when we acquire our pet rats, I am totally naming their glorious ratty mansion Milliways. After some good eats, the narrative gets weird again with more space ship theft, an interfering galactic ghost, and Zaphod’s destiny to find the true ruler of the universe. This leads to some confrontations, a very absent minded god-like figure, and another crash landing in the long distant past allowing Ford and Arthur to discover the truth behind the humanoids that populated that giant blue and green super computer in the sky. Then there is even more splitting up and frustrating attempts to teach Neanderthals how to play a decent game of scrabble. Incidentally, never ever throw the Y piece into the adjacent foliage. Satire, sarcasm, seismic jokes, space travel, and other cool alliterative word choices all apply to The Restaurant at the End of the Universe but . . . but, is there a, you know, point? The first novel, while crazy to the bone and infinitely proud of it, had a plot and a payoff whereas Restaurant just wants to have fun and doesn’t care if you get it – or if the original premises about Zaphod’s brain ultimately gets solved or dropped like a mushy rotten potato. You’re not really expected anything other than laughs, but there is a certain strain. The first narrative was brilliant and natural. The difference here is, this narrative wants to be brilliant and is trying far too hard to do so, leaving some strain and so many messy plot threads. So many. The mice would never approve. Still, it’s fun, and where else can you read about an entrée which begs you to eat it and a glamorous cheesy show of end times to accompany your after dinner aperitif? Get down with the sickness y’all, and reenter the wacky world of Douglas Adam’s distinctly schizophrenic imagination. *A Note on Edition: I listened to the full, unabridged audio CD edition as read by Martin Freeman. This edition amplifies the fun with Freeman’s expressive reading style and some space age sound effects making the marvelous robots even more amusing in their sterile, business ways. What’s better than a trip through a crazy universe? Someone to narrate it to you, of course!